Casey’s touch can reveal the one thing a person would never want to know—the number of days they have left to live. She avoids all human touch, until she meets hot, persistent PJ . . .
Casey’s touch can reveal the one thing a person would never want to know—the number of days they have left to live. By the time Casey turns seventeen, she’s learned to withdraw. But the phobia she fakes in order to avoid human contact is sorely tested by hot, persistent, motorcycle-riding PJ. For a girl who craves contact, maple-eyed PJ is impossible to resist. When the inevitable happens; when hands, bodies, and lips collide, Casey sees PJ's number, one that can only be seen as a cruel twist of fate. 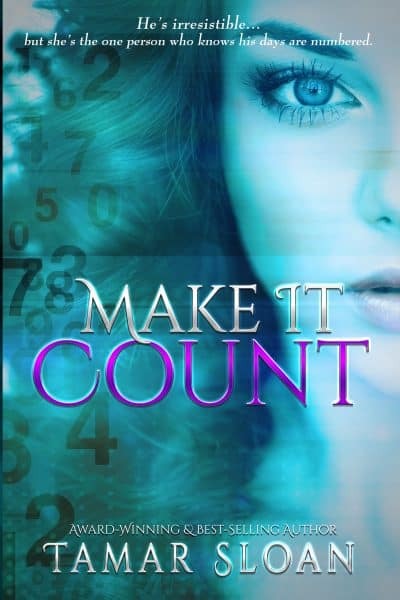 The winner of the 2018 Best Young Adult novel, Make it Count is a romance that will leave you swooning and smiling. Don't miss out on the book reviewers have called "one of the best books I've read this year"!